First introduced by European hotels the heated towel rail has now become a permanent feature in many homes across Australia. 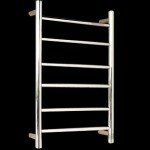 Many of the heated towel rails sold today even by Sydney Bathroom Supply double as towel dryers. However, the problem that many people who use these rails face is that the metal starts to deteriorate after some time. This can especially be the case with low quality metals that are prone to rust or corrosion owing to extended exposure to moisture and heat. That said we have some of the best towel rails in terms of durability and style from which to choose from. In addition, there are a number of other reasons why people continue to buy our heated rails which includes cost effectiveness, availability in numerous sizes and types, plus every one of them is backed by a guarantee. At Sydney Bathroom Supply we believe in offering people some of the best choices based on their budgets and tastes. This is why the heated towel rails we sell are available in a number of different metals like aluminum, steel, stainless steel etc. Every rail has been finished and plated with chrome to ensure extended durability which translates to years of use. Every rail uses a heavy duty plug and wire which can be plugged into any electrical socket after which it heats up in mere minutes. Once heated the rail also works as a sort of bathroom radiator keeping the bathroom warm for an extended period of time throughout winter. So, our rails effectively double as bathroom heaters, that said they are especially designed to produce enough heat to effectively warm up and dry towels without causing any harm to the fibers or cause the towels to stick to the rails. Our heated towel rail regardless of the model or type you choose is comparatively cost effective and uses electricity efficiently. This not only results in short term savings when you buy from us but also savings in the long term mainly because every watt of electricity is used efficiently. Special coatings and design ensures that the heat does not escape requiring the device to be constantly sucking electricity and racking up your bill. To find out more about our heated towel rails call 02 9675 6885 or fill out our online form for any information you may need requiring a bulk purchase.